draw, play with toys, read, write and so on. without worrying about kids eating or drawing randomly. Don't hesitate to buy it! 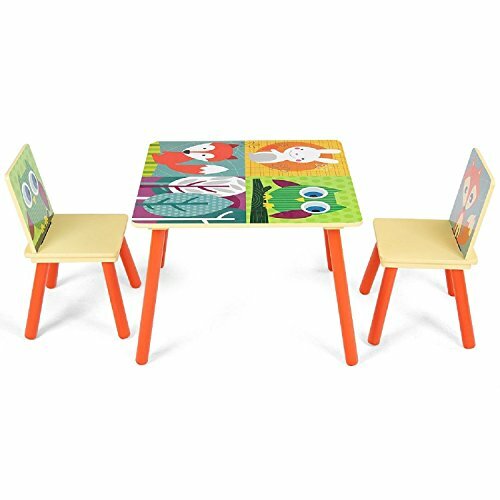 Multi-purpose: Children can eat, draw, play with toys, read, write and so on with this set of furniture, these table and chairs also can be used indoors or outdoors. So it could be used as children's dining table, activity table or learning table. Designed for children: The table's size is 23.5'' x 23.5'' x 17'', the chair's size is 10.5" x 10.5" x 19.5", and it's net weight is 25 lbs. There are very cute cartoon patterns on the desk and chair, your kids must will love this furniture. Sturdy & safe: These table and chairs are made of MDF P2, the solid structural design makes them even sturdy enough for adult. The patterns are also painted with non-toxic pigments, so you can safely let your child use this set of environmental-friendly, non-toxic, odor-free and smooth edges furniture. Easy to move: These kids table and chairs' net weight is 25 lbs, they are light, so the children can move the table and chairs by themselves, they can play with their friends freely. Easy to clean: The MDF P2 is easy for you to clean the table and chairs, you won't be worried about your kid to eat, write or draw at random on the table or chairs. View More In Desks & Desk Sets.